Now you can add as many fon clients as you like. Well, at least up to 3 will be shown in the new UI on the LCD 🙂 All others are still handled but not shown. While hacking the source I almost completely rewrote the XMPP based bots for mon and fon parts and added some nice features along the way: Configuration is a lot easier now and audio streaming was optimized. 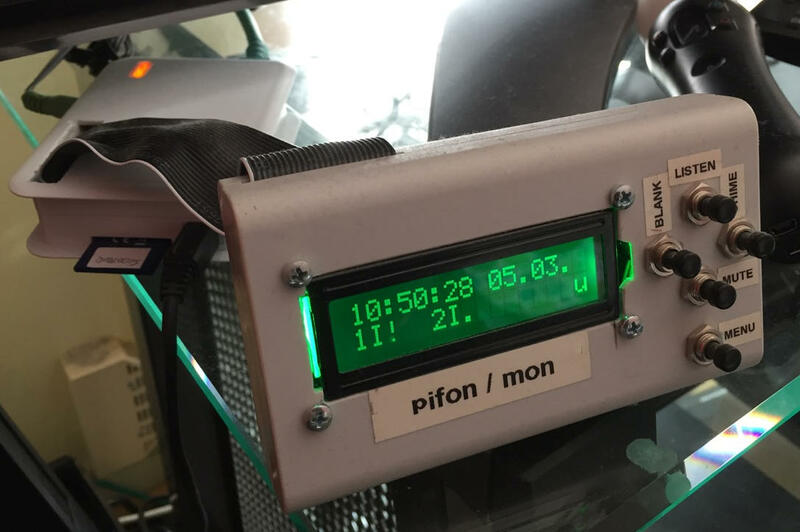 Now head over to the new pifon Project Page and start building your own now! In my plipbox project a fairly fast AVR 8-bit MCU with 16 MHz was connected to the Amiga’s parallel port to transfer incoming and outgoing IP packets from/to the attached Ethernet controller. A protocol on the parallel port was devised to quickly transmit the bytes in both directions. In version 0.6 a data rate of up to 240 KB/s was achieved… The question now arises if this is the top speed we can get or is the parallel port capable of more? This blog post shows the results of my experiments I performed with the parallel port on my Amiga. It tries to show different classes of transfers possible on this port and gives the achievable maximum speed of each class. Continue reading Amiga Parallel Port: How fast can you go? I am a big fan of those small TFT displays in the size of the Raspi. They even come with a resistive touch panel and allow you to realize small applications with full UI control. With the fine fbtft drivers from notro you can access them as regular framebuffers and use all software that runs otherwise only on “big screens” via HDMI. Most important change is the handling of the MAC address. While in previous versions you had to set the correct MAC in both the Amiga driver and the AVR firmware, the new version automatically transmits the MAC address from the driver to the firmware. Inside the driver you can alter the address with SANA-II commands (if your TCP/IP stack supports it). This allows you to set different MACs that are required if multiple plipboxes are running on the same network. I also added some features of the Ethernet chip to be enabled by firmware parameters: Namely full duplex mode and flow control are new options you can play with to tune the performance. The new firmware also tracks the online/offline state of the driver and enables or disables the Ethernet module accordingly. On the firmware’s command console I improved the device statistics output by adding the number of filtered, dropped or erroneous packets. Furthermore a new error log shows you if errors were found on the parallel transfer. Now grab your copy of the new release on the plipbox page and have fun!! That’s the reason why I always prefer having network access on all my machines for truly covenient file handling (e.g. with FTP, wget…). 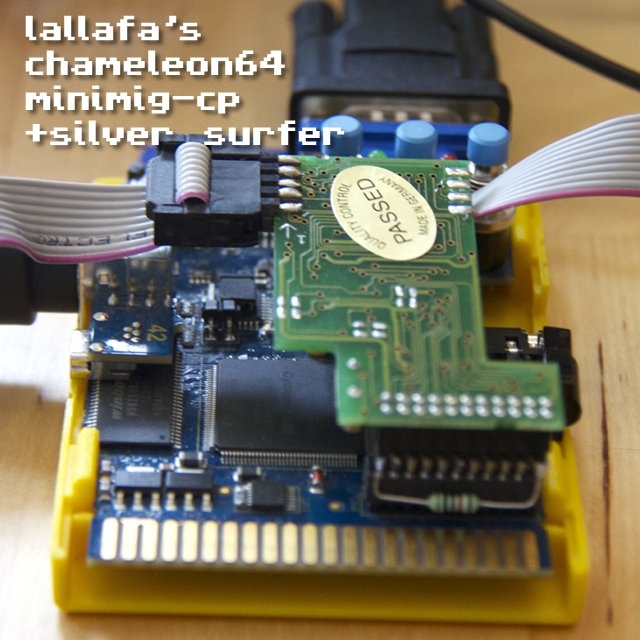 In my last post I showed you how to add a SilverSurfer high speed serial port to your Minimig running on the Turbo Chameleon 64. Now we will use this serial port that is running up to 115200 Baud with ease for something useful: networking! Old farts remember the times when home network access was done with PPP and a serial modem gateway. 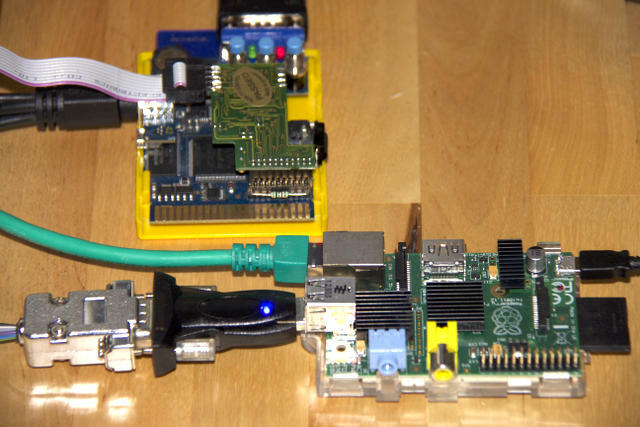 We’ll go that road but replace the modem and gateway with a small and cheap Linux machine, here the all hyped Rpi and a direct serial “null modem” link via an USB-to-serial adapter. Hmm, I thought… now with an Amiga running on the cartridge why not close the circle and make the clockport accessible to the Minimig, too?